Please note that the 2015 tour has finished. This is now an archived project. If you would like deatils of future 'Transform with Action' official tours or would like a specialised visit to your contry outside of an official tour then please contact us. Transform with Action. Attachment - Creativity - Empowerment. Professor Sue Jennings and Dr Andy Hickson will be delivering a limited series of innovative presentations and specialist creative workshops in a variety of venues around the UK and South East Asia. These creative sessions are designed for teachers, psychologists, counsellors, managers, staff, trainers, nurses, doctors, therapists, educationalists, facilitators, groupworkers, ministers, directors, governors, consultants and trainees. This is a limited tour of South East Asia and will include the following countries: Japan, Malaysia, Singapore, China and Taiwan. This innovative, creative and cutting edge tour is strictly limited to a first come first served basis. We will only accept bookings from organisations with a track record for producing high quality events. 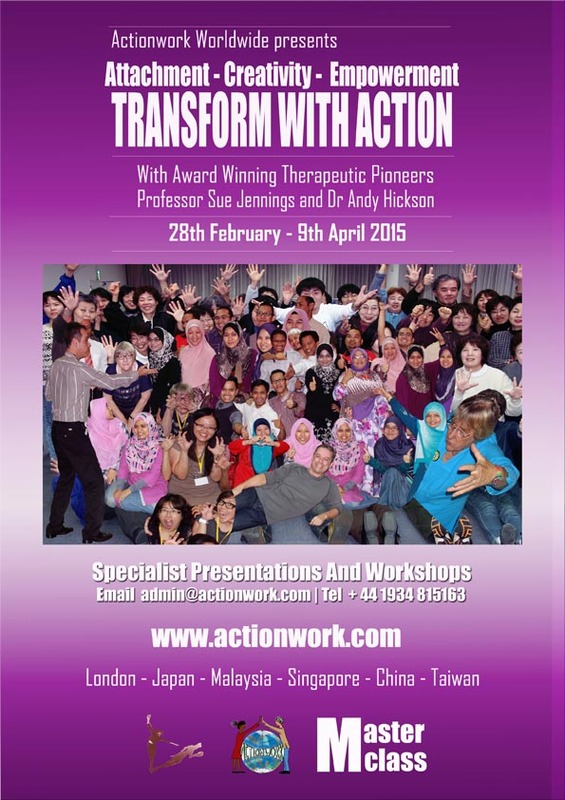 You cannot book individual places with Actionwork Worldwide, please see your country producer for details of how to book your place. If you would like to host a presentation or workshop on this tour please see below for further details. A 90-minute dynamic and interactive presentation which explores interventions based on attachment, empowerment, playfulness and neuroscience that can challenge and deal with violence, conflict and trauma in non-violent and creative ways. Strategies for work with mainstream and special needs groups will be demonstrated and backed up with scientific evidence and case studies of people with behavioural and emotional difficulties. The presentation will be bold, fun and innovative, at the cutting edge of contemporary research and theory. Delegates will be shown through action methods and other creative approaches, techniques and ideas that can be applied in their professional and personal lives. They will learn take-away skills and have opportunities to discuss methods. A 3-hour hands-on creative workshop will take participants on a journey of discovery and empowerment. These fully interactive training sessions will help build confidence, self-awareness, vitality, resilience, sociability and strength, which will promote the development of sustained positive creative relationships with family, friends, staff and colleagues in addition to diverse client application. There will be an emphasis on positive psychology that focuses on what people can do, rather than their deficits. We also focus on on rights and responsibilities, self-belief, empathy, best practice and on personal and professional empowerment. Professor Sue Jennings is an anthropologist, a pioneer play and dramatherapist, and author of over 40 published books. She has developed theories on applied attachment, play, theatre, healing, resilience and therapeutic programmes for children and people with special needs including autism, dementia, infertility, sexual abuse and trauma. Sue has worked in prisons, hospitals, infertility clinics, universities, colleges, convents, orphanages and on the streets in many countries around the world. Sue is a State Registered Dramatherapist, and a Full Member of the British Association of Play Therapists, and Founder of the British Association of Dramatherapists. She is President of the Romanian Association of Play Therapy and Dramatherapy, an accredited Counsellor and Psychotherapist of the Romanian College of Psychologists and member of the Society for Storytellers and Equity. Her awards have included the 2002 Gertrude Schattner Award (US), for distinguished contributions to the field of dramatherapy in education, publications, practice and service (first overseas recipient), the 2008 Laurel Wreath Award, Arab College of Mrar, Israel for Arab education, the 2009 Cycladic Award: for Dramatherapy in Greece, Aeon Institute, Athens, and Churchill Fellow (2012-2013): ‘Arts and Older People’ in Malaysia, Czech Republic and Romania. Currently Sue is Visiting Professor Taiwan University of the Arts and Visiting Fellow Leeds Metropolitan University. Dr Andy Hickson is a pioneering social theatre, anti-bullying and empowerment specialist, an actor, director, producer, writer, film-maker and anthropologist. He has had several books published and has contributed to a variety of magazines, newspapers and online journals. Andy has developed theories of dealing with violence and bullying in non-violent ways and creative empowerment programmes for children, young people and adults. He has worked in schools, colleges, youth centres, prisons, hospitals, theatres, work places and one the streets all over the UK and abroad. He produced the world’s first international anti-bullying festival and the first national anti-bullying conference for young people in the UK. Andy has had numerous media appearances including the BBC, CNN and MBC Television in addition to delivering keynote presentations at international conferences in Europe, Asia and South America. He is a member of the Society of Intercultural Education, Training and Research (SIETAR), the Anti Bullying Alliance (ABA), the All Party Parliamentary Group (APPG) on Bullying and Equity. Andy was given the Anti Bullying Flame Award in 2013. Please contact us if you would like to host a presentation and/or workshop. You can charge your participants to attend. When booking a presentation or workshop the sessions may be filled with as many participants as wished (up to our suggested maximum). Actionwork Worldwide is paid the agreed costs and fees. Organisers may decide that participants pay an attendance fee. Actionwork Worldwide will not take any commission on the fees nor get involved in how your events are priced. A flat fee is payable to Actionwork Worldwide to confirm the booking, (fees available on request). Organisations, bookers and producers are responsible for promoting the events and in securing audiences and/or participants. Actionwork Worldwide does not get involved with enrollment. Once a session is booked with us, we will promote it on our site and on social media. Presentation: There are no limits on the size of presentation audience. Audience numbers are limited to the size of your venue, but do not overfill! All audience members need to sit comfortably in chairs/seats and there should be aisles where speakers and audience members can walk through if required. Workshops: Numbers are limited to 50 participants for each 3-hour session. The venue should be large enough for participants to move around comfortably without bumping in to each other. There should be adequate seating for all participants. Organisations need to provide adequate insurance in case of cancellation due to illness, strikes or other matters outside of our control. If Actionwork Worldwide has to cancel for any reason a full refund is given on any fee paid to Actionwork Worldwide. If you Cancel a booking fees are be payable in full. Bookers and organisers are responsible for providing and financing an appropriate venue for the presentations and/or workshops to take place. Please ensure that the venue has adequate lighting, electric power points, a projector, and a projector screen. Please also ensure that you have adequate liability insurance (we will need to see proof of this). The presentation lasts for 90-minutes. We require 2-hours before the start of presentation to set up the equipment and run sound checks. The workshops lasts for 3-hours (with a 15-minute break). We require 90-minutes before the start of the workshop to set up, prepare and run space checks. Costs are negotiable depending upon what you book. Discounts are available for those groups who book a workshop and a presentation together on the same day or who book mre than one session. Costs are fully inclusive of all equipment and resources used by us, and our travel, accommodation, flights and taxes. If you would like to book then please contact us to check availability, arrange your programme and we can provide you a free quotation. There is no experience necessary or any age limits suggested to be involved as a participant in the workshops or as an audience member in the presentations. All our staff carry the relevant child protection checks (DBS and CRB) and are members of the relevant professional trade and therapeutic organisations.